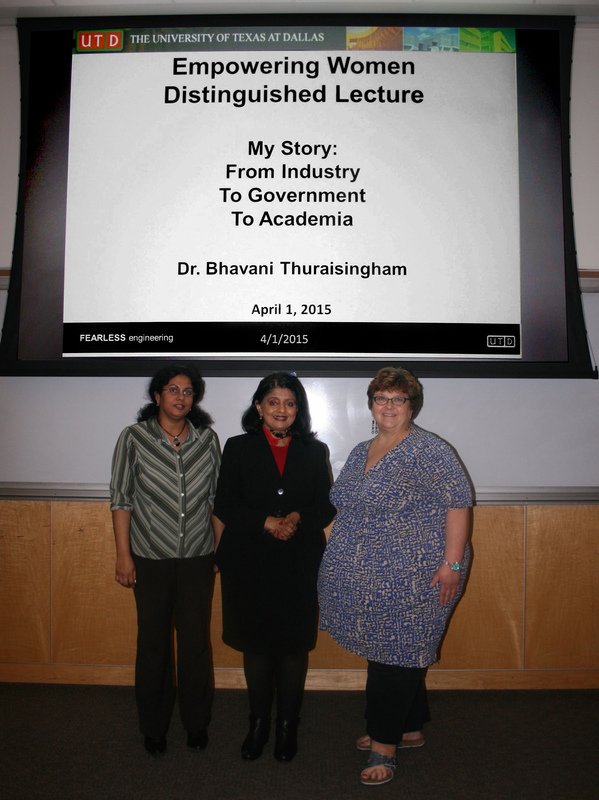 This past Wednesday, April 1st 2015, the Department of Computer Science at University of Texas at Dallas presented the first Grace Series lecture with Dr. Bhavani Thuraisingham as the inaugural speaker.  The objective of the Grace Series is to present a program of lectures about the role of women in today’s technology fields and provide inspiration to female graduate and undergraduate students in Computer Science and Software Engineering. The Grace Series will feature talks by the UTD Computer Science faculty and other distinguished lecturers. 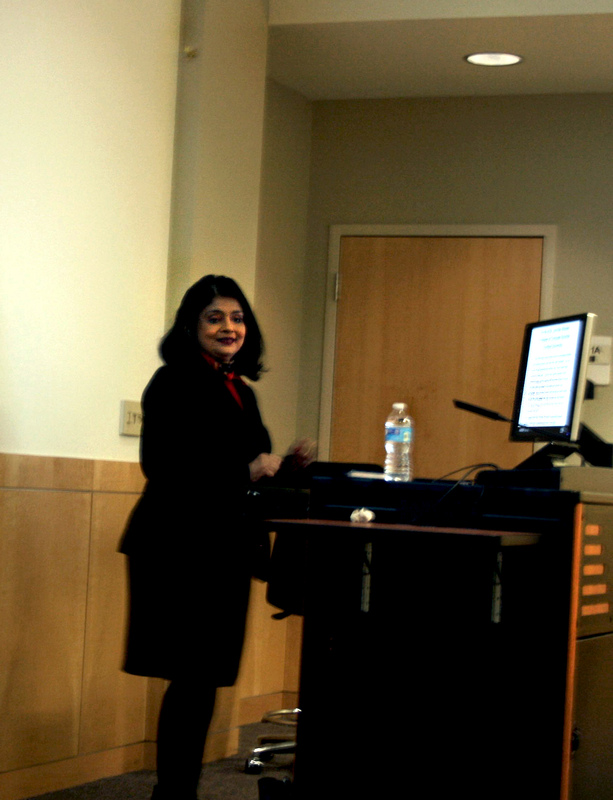 Dr. Bhavani Thuraisingham, a UT Dallas Professor of Computer Science and a Louis Beecherl Jr. Distinguished Professor, delivered a talk titled “My Story: From Industry to Government to Academia.” Dr. Thuraisingham told us her life’s story; she grew up in Sri Lanka where she was educated mostly in convent schools run by Irish missionary nuns. She received her B.Sc. in mathematics and physics from the University of Ceylon. At the age of 20 she moved to Bristol, England, with her husband and started her graduate education at the University of Bristol where she got her Masters in Mathematics. She then went on to complete her Ph.D. from the University of Wales at the age of 24. At that time her son was born and the family decided to immigrate to the United States. While waiting for their visas, Dr. Thuraisingham took care of her son, taught high school math in the evenings, and wrote research papers in her spare time! Her first stop in the US was in New Mexico where she was a visiting professor at New Mexico Tech. From there she went on to Minneapolis where she taught at the University of Minnesota. She remembers these first years as very productive, getting research papers accepted in top tier journal and spending time raising her son. In 1982 she became interested in more applied areas of computing and decided to complete an MS in Computer Science focusing on systems. She then went to work at Control Data Corporation designing and developing networks and distributed system – a change from her PhD work. In 1985 she went to work for Honeywell where she began her research in data security and data management, starting on the path that eventually led her to UTD nineteen years later. She spent the next fifteen years in Boston working for the MITRE Corporation where her research progressed. She published papers in premier journals, received numerous patents, and wrote her first book. In 2001, change was in the air and she accepted a one-year position at the National Science Foundation (NSF) in Washington. One year turned into three and at NSF she started new programs, collaborated with other agencies, and gave talks at the United Nations and the White House Office of Science and Technology Policy. Taking advice from her mentor at UC Berkeley, Dr. Thuraisingham decided to move to academia in 2004 – finally pursuing her dream of becoming a tenured professor. Her husband had three criteria for a move – relatively inexpensive place to live, great hospitals, and a hub city. Dallas fit the bill and UTD offered her a tenured position. “Dallas is the ideal place for me – I love the weather(! ), the people and the university.” At UT Dallas, she is the Director of the Cybersecurity Research Center that celebrated its 10 anniversary last year. Dr. Thuraisingham both began and ended her talk speaking on the importance of education in giving women independence, of empowering women, not only in the US but also in developing countries. She is a living example of this, having travelled from Colombo in Sri Lanka to Dallas, Texas. For more about Dr. Thuraisingham, please visit her website where you can read her full story and learn more about her research interests. The idea of the Grace Series talks at UTD was conceived by CS faculty members Drs. Kumar Puspha, Janell Straach, and Linda Morales after attending the Grace Hopper Celebration of Women in Computing (GHC) Conference last year. 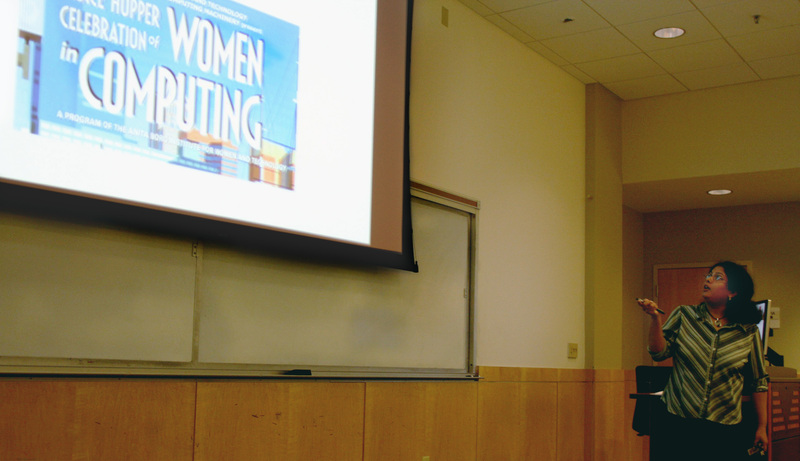 The conference, aptly named after the woman who helped pioneer computer programming, Rear Admiral Dr. Grace Murray Hopper, involved a series of presentations designed to bring research and career interests of women in computing to the forefront. The UTD CS Grace Series lectures is patterned after the GHC Conference format. (Left to Right) Dr. Pushpa Kumar, Dr. Bhavani Thuraisingham, Dr. Janell Straach. 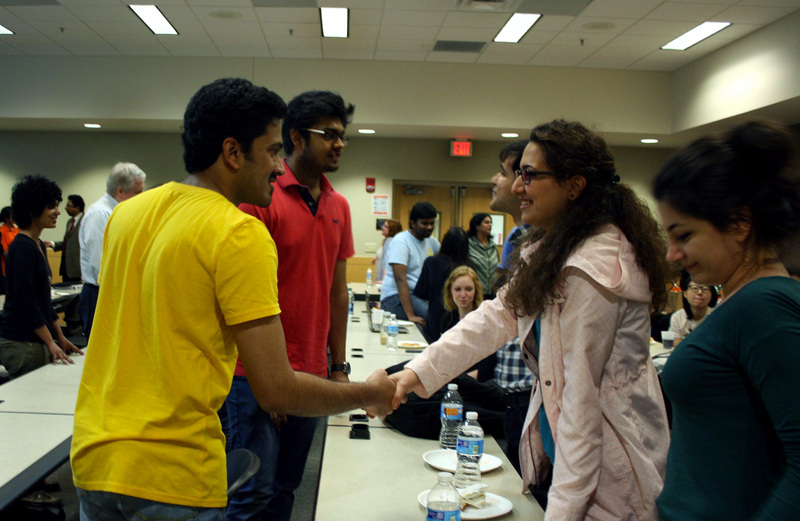 Dr. Pushpa Kumar started the talk off asking students to introduce themselves to each other. Dr. Pushpa Kumar speaking about the importance of the Grace Hopper Convention and introducing Dr. Bhavani Thuraisingham. 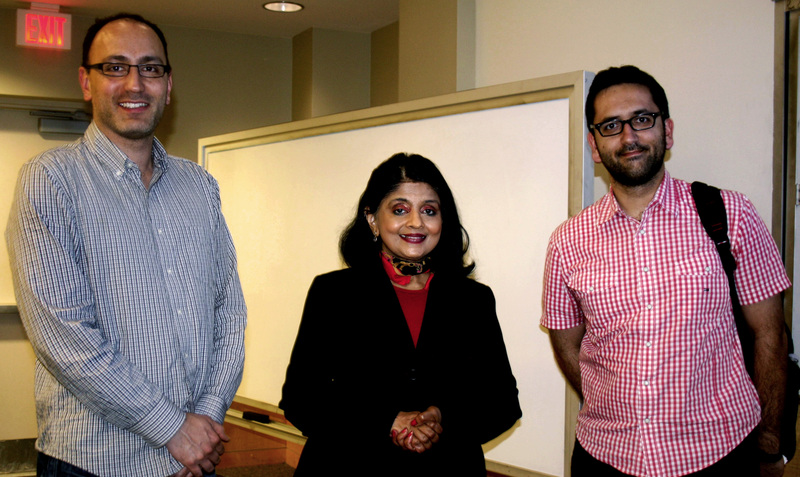 (Left to Right) Dr. Alvaro A. Cárdenas, Dr. Bhavani Thuraisingham, Dr. Murat Kantarcioglu. 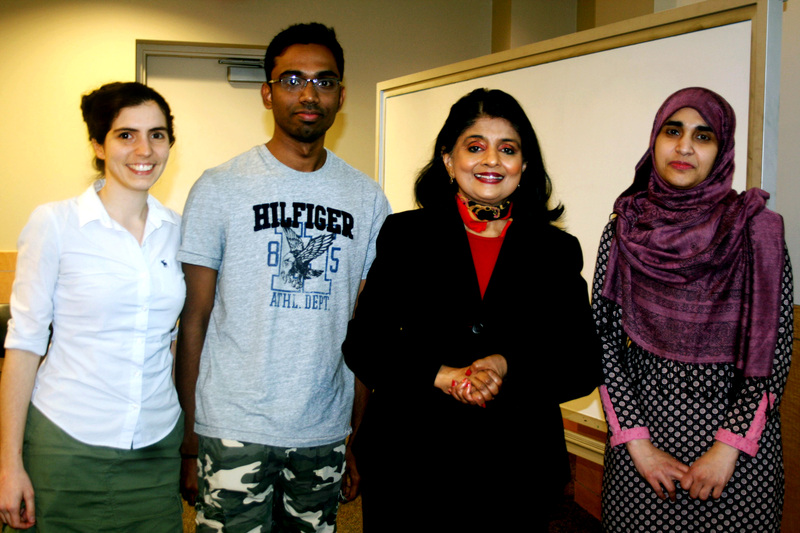 (Left to Right) PhD student Junia Valente, Gunasekar Rajasekar, Dr. Bhavani Thuraisingham, Pallabi Parveen, PhD. 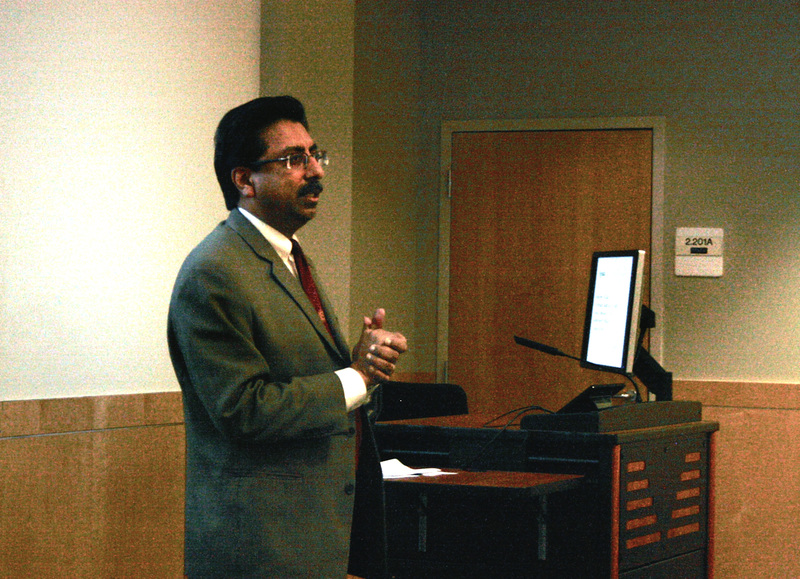 Dr. Gopal Gupta welcoming attendees to the first lecture of the Grace Series. Dr. Bhavani Thuraisingham speaking at the Grace Series. To view Dr. Bhavani Thuraisingham’s presentation click here.